The first time you visit Porthcurno, you might think you’ve stumbled into paradise. With its distinctive white sands and clear turquoise waters, it looks like somewhere distinctly more tropical. While the far west of Cornwall takes a little more effort to visit, it’s certainly worth the time it takes to get here. There’s plenty to inspire and delight, whatever age you are. 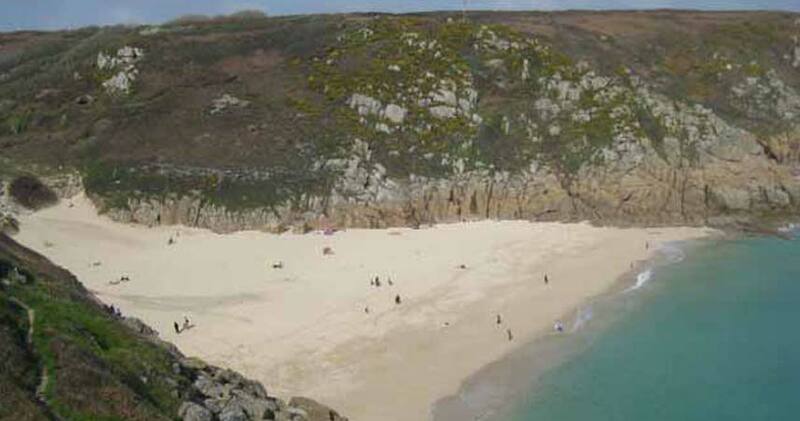 Popular with families, Porthcurno Beach is a joy. The high cliffs provide shelter and there are some lovely walks nearby. On a clear day, you might be able to see the Lizard peninsula and even the Isles of Scilly. There’s a large car park close to the beach with easy access down to the sand, plus a cafe across the road, and public toilets. The beach is safe for swimming and it’s patrolled by lifeguards between Whitsun and mid-September (please note there’s a seasonal dog ban between Easter and the end of September). There’s also a stream near the top of the beach which is ideal for little ones to paddle in. It might be hard to believe today, but Porthcurno was once the hub of the British Empire’s communications. The first submarine cable in the country was laid here in 1870, and over the next 100 years it changed the face of international communications. The Porthcurno Telegraph Museum is currently closed for development, but they’re set to re-open in the summer with some exciting exhibits and new visitor facilities. While the Minack Theatre needs little introduction, it has to be experienced to be really appreciated. ‘Minack’ means ‘rocky place’ in Cornish, and it feels almost as if the theatre has grown out of the cliffs. Its creator, Rowena Cade, built much of it herself – an impressive feat by any standards! This dramatic open-air theatre draws thousands of visitors every year. The best way to experience it is by going to one of the evening shows during the summer. As the sun goes down, the action unfolds on the stage below you. There’s a diverse range of performances to choose from, including productions of Shakespeare’s plays to modern drama, musicals and opera. They also put on children’s shows – check the website for details to find out more. The Minack also welcomes visitors during the day, and you can find out more about its origins in the visitor centre before exploring the theatre and the fabulous sub-tropical gardens. If you’re looking for something a little different that will engage the whole family, try the Porthcurno Circular Treasure Trail. Treasure Trails are particularly good for families with older children. A fun, imaginative to make the most of the area, you can enjoy the challenge of cracking the clues along the route, and there are no maps required – just follow the clues. If you do get stumped there’s even a handy Trail Trouble Textline to help you out! The far west of Cornwall is outstanding walking country with spectacular views around every corner. The South West Coast Path runs right through Porthcurno and is definitely worth exploring, even if you only go a little way. There are hidden coves that can only be reached on foot and plenty of opportunities for wildlife spotting. There’s a lovely three mile circular walk from Porthcurno along the cliffs which is great for families. The walk passes though Penberth, a pretty fishing village which is owned by the National Trust and has featured in TV adaptations an film productions of novels by Cornish author Rosamunde Pilcher. The route will also take you through Treen, where you’ll find The Logan Rock Inn, a characterful, dog-friendly pub ideal for a spot of lunch. From Bosinver it takes approx 1h 15 minutes to get to Porthcurno. Postcode for SavNavs: TR19 6JX. Have you visited Porthcurno during your holiday to Cornwall or been to see a performance at the Minack? We’d love to hear what you thought of it. Add your comments below or share your thoughts on our Facebook page.